I was checking the news on Google this morning, and came across an article reporting the release of a new Netscape browser. The existence of a new browser was nothing new to me; it had been well reported previously. However, now that it has been released, I decided I should download it and see what it's like. As soon as you install Netscape 8.0, you can see the Firefox influence. That's because it's more than an influence; Netscape 8.0 is Firefox. However, Netscape aren't at all lazy - they've made plenty of changes (which includes increasing the download size from 4 MB to 12 MB!). As well as Firefox (and therefore the Gecko rendering engine), Netscape 8.0 also uses the Internet Explorer rendering engine. Yes, both. I have mixed views on this. It's obvious to see where Netscape were coming from: most of the Internet's web sites are (unfortunately) designed specifically for Internet Explorer. This is a problem many people have faced when using alternative web browsers, such as those based on Gecko (Mozilla browsers), KHTML (Konqueror, Safari, etc.) and Opera. The problem is Microsoft, being the independent thinkers that they are, are not satisfied by web standards as set out by the W3C. They like to make the web a "better experience" by adding little quirks which only IE understands. Also, IE just generally interprets certain HTML and CSS differently to other browsers (usually against the W3C recommendations). Netscape have attempted to overcome the problem of Gecko not rendering 100% of pages correctly by adding native support for Internet Explorer. In practice, this does indeed work very well and is well implemented. Each web site has a set of rules (easily accessible on the tab for each page by a small yellow shield). 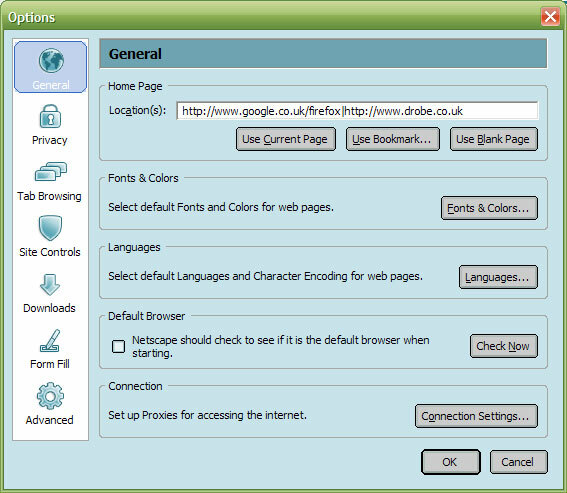 These rules include how the page should be rendered; by Netscape (Gecko) or Internet Explorer. When using Internet Explorer mode, the page is sent to the Internet Explorer rendering engine (which any third party application can use) to render the page. To Netscape's credit, they've done a very good job at this integration. The user interface remains identical - in effect, you have Firefox hosting Internet Explorer. However, even the right-click context menu remains almost unchanged between "Netscape" and "Internet Explorer" mode. Only a few options are added and removed due to inabilities on each platform to do that task (i.e. "View background image..." on Netscape is not available for Internet Explorer). So this is a very helpful and well implemented feature. However, what effect does this have on the Internet? Considering the recent popularity of Firefox, and the brand name Netscape holds, I can foresee this being a very popular browser. It could not only be a threat to Internet Explorer, as Firefox has been, but also Firefox itself. This is what worries me. At the moment, there are still many web sites which are IE specific in design, hence this new feature in Netscape. However, many large sites are moving towards standards based web site designs, which is no doubt having an adverse affect on other smaller sites which want to mimic the more popular sites. Now that this feature is available, there is no need to change your site to work in Firefox, or any browser other than IE. This must not happen. Standards are there for a reason (many in fact). They include accessibility, both by the disabled and those who use different browsers or devices, and standardisation so a site looks the same no matter what is rendering it. The Netscape 8.0 browser window, displaying your favourite blog. Netscape have done, mostly, a very good job of producing a new interface. The browser window itself is excellent, and is swaying me to switching from Firefox! Those of you who use Firefox (and if you don't, you had better have a good excuse!) will know that it supports Themes. These basically change what the user interface looks like, and due to the flexibility of XUL (the language used to describe these themes) the user interface can be completely changed. This is basically what Netscape have done with the user interface, and the changes are excellent. There are no native features of the OS - the title bar is skinned to blend in with the toolbar. It's all very soft and bumpy, which I think is a nice design. They've also chosen a pleasing shade of blue (I think this is the Netscape blue) with hints of orange, which also works very well. The interface is generally very comforting, which is likely to be what Netscape were aiming for. One of my favourite features of the interface itself is the flexible toolbar. Below the standard navigation buttons, there is a row of small numbered buttons. Clicking these loads new dynamic toolbars to the right. These toolbars include search fields, bookmark drop-down lists and live feeds. The live feeds include everything from headlines in several topics to Web mail checking and weather updates, and include any of your own from sites providing RSS news feeds. There are also stock quotes, maps, directory enquiries, and the usual bookmarks toolbar. The new options dialogue, showing the ugly caption buttons. As well as all of the great features of Firefox, Netscape have also added a few of their own. There is the form filler, which seems to be a re-working of the Firefox Password Manager (although Netscape promise to improve its functionality for the final release, including form filling for typical name, address, email, etc. fields), site trust features (which basically defines global browser security settings for each web site and includes which renderer to use) and additional changes to the tab browsing interface and popup blocker. In general, all these features are very good, although I'm not 100% sure about the changes to the popup blocker; personally I think they open the browser the more pop ups rather than improving its functionality. Also, the sidebar has made a come back from Netscape 7. The colours aren't quite right yet. Overall, my response is very positive towards Netscape 8.0. Admittedly, I haven't been using it much (I only downloaded it this morning!) however it has proved to be very stable for a beta product. I love the new theme, but there are some minor technical issues I have noticed with the interface. The main browser window has obviously had a lot of work, and I'm very happy with what Netscape have produced here. However, the status bar could do with some regression - I prefer the facilities available in Firefox (RSS feeds are always displayed here, as are alternative "Page Styles"). My only other niggles lie in what lays under this cover. Dialogue boxes still look like Firefox dialogue boxes, which is good, but a few colour settings have slipped through the net (like the tab colours in the "Page Info..." dialogue) and I can't stand the caption buttons! All caption buttons are a grotesque shade of grey - they really should be coloured the same as the window background with subtle changes to saturation and brightness. Also, some of the interactive features (such as drop down features from Live Feeds) don't always load correctly, but I'm sure this will be fixed for the final release (and technically should be ignored in a review such as this!). Also, it would appear that the search item on the toolbar cannot be customised! It's either Netscape or Netscape where search is concerned - I hope Netscape change this in a future release. I really like the new Netscape. I remember when I first tried Netscape 6, I was not impressed by how bloated the suite was. There were also many problems, however these were mostly due to the Mozilla suite it was based on. Mozilla fixed all these issues, and Netscape 7 was much improved, but still nothing compared to the new Netscape 8.0. The new Netscape does not include an email client, address book, calendar or page writer, but I don't think that will matter. Email is continuously moving towards web mail, for which Netscape 8.0 has fully integrated support (even supporting GMail :D ). I am concerned, however, by the massive increase in download size. I cannot comprehend how 8 MB has been added to the download over Firefox. The theme can surely only take one or two megabytes, and the Internet Explorer rendering engine is built into Windows! Hopefully, this will also be fixed for the final release; not many people like downloads as big as 12 MB. If this is a sign of what can be done with Firefox, then I await the rumoured Google browser with great anticipation! N.B. : As you may have noticed, I'm not a big fan of AOL. The few months we used it, it drove me mad. I cannot comprehend why any body would want to pay to use such a poorly constructed web browser. AOL's service as an ISP, however, is very good. Unfortunately, they insist you use their software to connect. I just switched to FireFox and Thunderbird from Netscape last week. I fell in love with RSS instantly! I hope that soon Netscape and Outlook begin to support RSS in their email clients. Did you read the EULA? It says they can update your computer at will WITHOUT telling you! Check paragraph 5 of the End User License Agreement. I refuse to knowingly use software with these sorts of terms. Signed by a retired curmudgeon! anonymous: I realised this after reading what I wrote later. This is just poor wording. Thank you for pointing this out to avoid confusion. anynymous: Netscape don't produce an email client any more. They've only just released another browser. I suggest you stick to Firefox and Thunderbird - any new Netscape browser or email client will only be based on these. I expect it won't be long before someone releases Firefox extensions which provide the toolbar ticker feeds which Netscape 8.0 has! While I am not one to leap to IE's defense -it certainly has many frustrating bugs and a lack of support for a number of things- to say it's all IE's fault or that Gecko does render all pages correctly is too far in the other direction. All html rendering engines have their quirks, and Gecko is no different. It may exceed MSHTML in some ways, but there are several situations where what it renders is just plain wrong. I write HTML and CSS according to W3C specs, and half the time it looks right on IE, half on Gecko. Either way I have to massage it until it works on both. Firefox shines because it is simple to use and very powerfull. Netscape beta is nice, I agree. But it is cluttered with xtra features I will never need or use. The skin is cluttered which stuff I would never use (5 bars for news/RSS stuff???). There's also only 1 search engine (netscape's) and you can't change it or add other engines. I saw it also contained e-mail (with only the option to use netscape mail (I prefer gmail) and it has alot of other options I would never want to use, like the tabbed browser options (about 20 checkboxes for tabbed browsing alone). It's like opera only slower and with less features. I think the Netscape beta is a big failure for three reason. One, as you mentioned, is that it's removing the incentive for web designers and operators to get with the times and write a cross-browser site. Two, it's bloatware: in other words, it's moving in a completely opposite direction from what made Firefox popular (streamlined and no IE engine). Third, it really is a horrendous thing to look at. It's like WXP's Luna theme: gawdy and cartoonish. I haven't played with it yet so I can't really comment on the functionallity, but from the pictures it just feels "too much", it makes me *not* wanna download it. ...think I´ll stick with FireFox. Well, in the first copule paragraphs of the EULA, it said that the new netspace comes with AIM, su there is some of your bloat right there. As for the download size: Mozilla/Firefox cannot bundle much external software for which it doesn't have a license. Netscape is a commercial entity backed by big money over at AOL. Netscape can afford to license external software such as Flash, Java, etc. And as somoene else pointed out, they've also bundled AIM such as to promote company prodcuts. It is true that all HTML/CSS renderers have their quirks, but if you use a DOCTYPE that triggers standard compliant rendering in both IE and Gecko, you will find that the Gecko quirks are few and in fairly obscure corners of the CSS specification. In comparison, IE simply doesn't understand large parts of CSS 2 (typical examples: position:fixed, attribute selectors, generated content). I would say that Gecko's and Opera's CSS renderers are about even in standard compliance (with each their obscure quirks), while IE is simply lacking. expecting the final version to shrink the 12mb download of the beta? that's a bit of a wishful thinking, no ? Just thought i'd say that Netscape isn't firefox. Firefox is Mozilla, Netscape is Mozilla, therefore, Mozilla is the basis for Netscape and Firefox. I didn't like the experience myself. I found the overall interface to be harder to use than expected and lacking many of the key visual indicators I look for to help me perform tasks. It be great to do some actual testing to see how it stacks up. IMHO Netscape 8 beta is the best thing since freshly sliced bread from my automatic bread machine. One of the reasons the Firefox has not been adopted at my organization is the simple fact that it does not work with all websites (including some internal applications). Everyone can wish that IE did not exist but the simple fact is that IE related content is here to stay. Now my organization has a viable alternative to IE (albeit IE is built in to Netscape 8 beta). What I'm wondering, in terms of UI developments in FireFox (or Netscape, or any of them) is when it's going to get through to them that using the Go button or typing something into the Go bar is fundamentally not all that different from using one of the search plugins. So why not just have one bar, and make "Go to URL" one of the items in the dropdown, along with Google, Wikipedia, et al? ?We cannot live for ourselves alone. Our lives are connected by a thousand invisible threads, and along these sympathetic fibers, our actions run as causes and return to us as results.? I have a anti-virus site/blog. It pretty much covers ##KEYWORD## related stuff. Are you interested in web hosting plan? If so, I have a web hosting plan site. I have a hosting personal services web site. It pretty much covers ##WEB HOSTING## related stuff. I have a virus scan Site. Scan your PC and find the Malware. I have a web hosting service provider site. It pretty much covers ##WEB HOSTING## related stuff. I enjoyed reading your blog. There is a lot of useful information about new home based business opportunity in it. We offer Turnkey Websites and Reliable Hosting. We also provide a blogging service that will help your site get indexed fast and keep the search engines visiting your site. Click here for more information about new home based business opportunity. some free info. on php web hosting check it out. Informative blog about affordable web hosting. I enjoyed reading your blog. There is a lot of useful information about web server hosting in it. We offer Turnkey Websites and Reliable Hosting. We also provide a blogging service that will help your site get indexed fast and keep the search engines visiting your site. Click here for more information about web server hosting. I enjoyed reading your blog. There is a lot of useful information about ink site toner turnkey web in it. We offer Turnkey Websites and Reliable Hosting. We also provide a blogging service that will help your site get indexed fast and keep the search engines visiting your site. Click here for more information about ink site toner turnkey web. I have a free name free web hosting site/blog. It pretty much covers free name free web hosting related stuff. I have a best web site hosting site/blog. It pretty much covers best web site hosting related stuff. My site - Global Domain Name Registrations - open event during one month domain hosting. http://www.globalnames.com You better check it out some time. It pretty much covers broadband satellite internet access related issues. 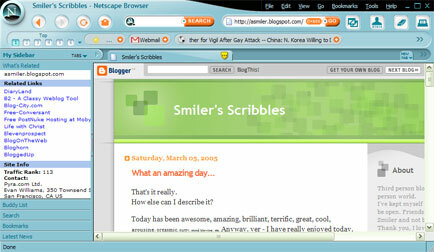 I was looking around and I just found your very nice blog, Smiler! It pretty much covers fast web hosting related stuff. I must congratulate with you Smiler because of this wonderful blog! It's really full of informations! Maybe you could be interested in having a look to my internet site that includes informations about scommesse ... if you are interested in scommesse it's the right place for you! It covers web site hosting company related contents. It covers website hosting brisbane related contents. It pretty much covers web site hosting review related issues. Here is some additional resources for Toolbars with over 50 features and included is a list with Most all toolbars now used. While out surfing today for specific info on real home based internet business, I ended up on your page. I will bookmark your site for a future visit, and should you ever need it, there is plenty of information on this site about real home based internet business. Hey!! Very good information here :0) I just got inside from washing and waxing my car. It is my prize posession. Took me 3 hours though. So I settled down into my office and started doing some web surfing. Anyways I am in the process of grabbing my associates degree and have spent the last 6 months researching best has hosting web who. In the middle of my browsing I landed smack dab in the middle of your blog. I hope you do not think I am invading but I must say it is great blog. Even though your blog is way off base from best has hosting web who I found myself cruising through your blog archives for the last hour :0) You have some nice blogging friends. Anyways, I need to get back to my mission. I wrote down your url and feel free to visit me here at best has hosting web who. I am so busy so I can only update my site weekly. Keep up the awesome work. Sad to say I just got back from a bowling tournament and decided to log in and do some websurfing. I love your blog. It had some very good laughs. I am doing a paper on best web hosting reseller and have been downloading information for the last hour. I don?t know how I came across your blog but I am glad I did. It has set me back a little because I have spent the last hour reading your archives. If you don?t mind I would like to add you to my favorites so I can back again and read some more. Well I need to get back to best web hosting reseller. I am almost finished with it. Great job. Just blogging for a while, found your site that also happens to be around web hosting ct, so just saying what's up. A lot of interest for your blog and a great deal of discussion. Great sites to surf domain resale, domain name, domain reseller, au domain, free website, online business, home based business, electric scooter, xbox360! Need stinger anti virus software? Click here to download stinger anti virus now! If you have a moment, please take a look at my runescape how to make money site. Home Based Business I have found a program that drives specific targeted traffic to your home based business opportunities. Anyone can use this system and implement it to your very own web site you have now. This seems to be a company who has cornered the market with their home business opportunities and providing targeted traffic for work at home campaigns. They even customize it for your campaign if you wanted so you get specific targeted traffic for your project only. This method is a no-nonsense, set it and forget it system, which will virtually run on 100% autopilot. People just like you are earning enough money to quit their jobs within the first month. Try the system before you fire your boss. Stop worrying about the bills, cancel your daily commute, never leave your family for a job that is making someone else rich, and start living your life the way YOU choose! New fail-safe system virtually runs 100% on autopilot. Just set it and forget it! - Your Traffic Driver System The best part about this company is that they also are experts in providing custom branded autoresponders and powerline systems that you can brand to your own company and content online live. Great Blog, Have any of you seen this page photo site.the idea of photo looks good, I'm thinking of buying one. Really great blog I've bookmarked it - now some really important bits of financial advice - as it is along the same lines I thought I would share this info with you. We were paying far too much for items like kids clothes, games consoles, car insurance/home insurance/pet insurance, broadband, mobile phones and utilities/loans, do it yourself home improvement etc. Then a friend of mine recommended a site called www.bargainplace.co.uk. We were able to get cheaper electricity, gas, mobile phone, broadband and loan deals at bargainplace. Thanks to my friend (and the site) I am saving something like £100 a month and can afford an extra holiday a year. Booked of course on www.bargainplace.co.uk. Thanks bargainplace ;-) !! PS - I set up a website a couple of months ago and until recently I was getting no traffic at all. Then, I signed up to Linkreferral.com. Not only did I start getting visitors by the truck load, I also joined Affiliatewindow and am now making lots of money by partnering with companies like Argos, Next, John Lewis, Pixmania, Marks and Spencer, LX Direct, Littlewoods, Vodafone, phones4u, phones2u, Sky, NTL, Virgin Media, Talktalk, Woolworths, Empire Direct, ebay plus online gambling sites - you can make pot loads of cash. Linkreferral.com is absolutelely free and has really helped my business take off. Follow these free tips and you won't go far wrong - that brand new BMW or Mercedes might just be around the corner!! I just saw a very good website about photo be a star site. It has a lot of information on photo be a star related stuff. Hey, has anyone seen this new site about franquicia. It's pretty good! great great in new normal opportunity risk time. I am bookmarking it. Thanks for the tips and insights. I run site and blog for home business internet marketing feel free to drop by and comment or swap links. I enthusiastically trust that the facts and strategies presented is associated to each of us . Thanks . Locksmith Brisbane Northside I am really charmed to peruse this post conveys incalculable of supportive data, much appreciated! !